Ah, that’s more like it. If cooked tomatoes are going to get all soft and squishy, then let’s put them in a pasta dish where that won’t matter! You expect tomatoes to be soft and warm and squishy in a pasta sauce. Normally, when I have too many cherry or grape tomatoes and can’t get them all into salads before they go soft, I use them in my Fish & Tomatoes dinner. But it’s nice to have other options, and this Spaghetti with Heirloom Cherry Tomatoes seemed like an easy place to start. It’s incredibly simple: just tomatoes, oil, and garlic to make the “sauce”, then some fresh mozzarella and basil added after the pasta’s tossed in. Because the sauce is so basic, the quality of the ingredients makes a difference. I used fresh basil leaves from my garden and found some of the good squishy fresh mozzarella at the cheese counter at Wegmans. I didn’t use “heirloom” tomatoes, as the goal was to use up my grape tomatoes that had already started to go soft, but I don’t think that took away from the flavor. Where I compromised was to use a store brand box of fettuccine. Oh, it was still a tasty dinner. But I think if I’d splurged on some fancier pasta, or gone all-out and made my own fresh pasta, it would have taken it to a whole other delicious level. Yay, an excuse to try making fresh pasta again! I’ll just need a free weekend, because that’s a big project! 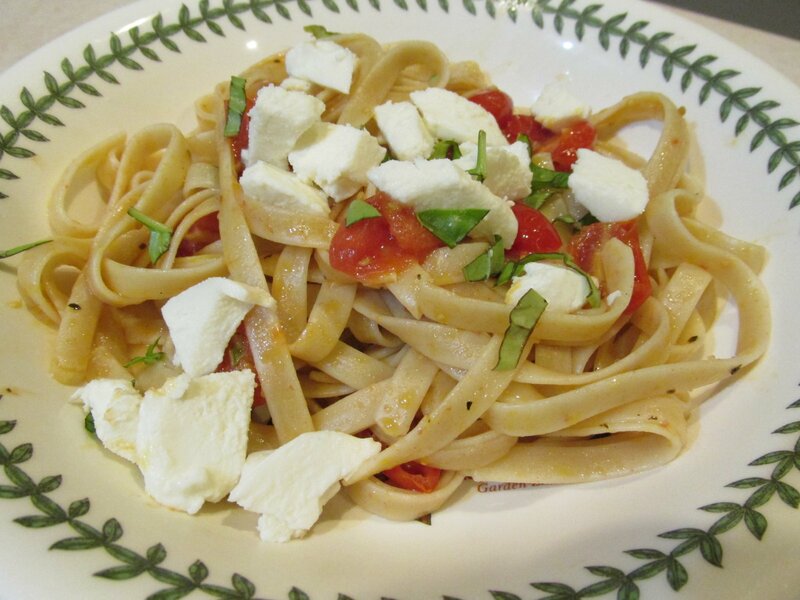 This entry was posted in Food, Uncategorized and tagged pasta, recipe, tomatoes on June 30, 2013 by antijen.